With a positive balance after 10 years as president of Ecuador, Rafael Correa helped Alianza País emerge victorious in the second round of the presidential elections in early 2017. But a complete turnaround was soon on the cards: newly elected president Lenín Moreno started to attack the legacy of the Citizens Revolution that had gotten him elected. An important part of Alianza País, faithful to the social policies of “Buen Vivir” (“Good Living”), disapproved of this. Then, vice-president Jorge Glas, who could be counted among these critical voices, was removed from his post and again put in the media spotlight, accused of corruption amidst the Odebrecht affair. A mere coincidence or fate? After four months of pre-trial detention, in January 2018 Jorge Glas was sentenced to six years in prison. Silvia Glas, economist and sister of Jorge Glas, granted an exclusive interview to Investig’Action, in which she exposes the “lack of evidence” for the verdict and calls for breaking the media blockade surrounding this case. Alex Anfrons: On May 24, 2017, a new government took office in Ecuador with Lenín Moreno as president and Jorge Glas as vice-president. When does this winning partnership sour? Silvia Glas: We can point to two important moments: on August 2nd, 2017, in a public letter, Jorge Glas denounces alleged irregularities in the governance of Lenín Moreno. Moreno then relieved Glas of all his legally mandated duties on August 4th, as a consequence of this “disrespectful letter”. From this point onward the plot thickens. At the end of September, after Jorge Glas held a press briefing in which he denounced the harassment against him and pleaded his innocence, the following day, a Friday afternoon, there was an announcement that his legal status was being reviewed. In other words, he could go to jail immediately the following Monday. These things always occur in circumstances where the ability to react and defend oneself are impossible. Then there was the arrest on October 2 based on new and “damning” evidence. In the trial it was revealed that this consisted of criminal assistance from the United States and Brazil, in which the name and post of Jorge Glas are never mentioned. Not only that, the source of both documents is the company itself which is guilty but was acquitted in Ecuador. Since then, there has been a growing number of human rights abuses against the former vice-president. AA: A vice-president forbidden to exercise his mandate… How do you explain it? SG: With his illegal removal, the will of the Ecuadorian people, which had elected a vice-president at the polls, has been betrayed. The proven irregularities during the breaches of due process and in the very short process of finding a new vice-president show a clear intention of getting rid of someone who had been elected by the people. We hope that international instances will scrutinise these irregularities soon. Just to mention some of these irregularities: 1. The decision to impose pre-trial detention was arbitrary, it met none of the requirements stipulated by international agreements on people’s rights. 2. An alleged absence of the letter in which the vice-president gave notice of using his legally allowed holidays to have the necessary time for his defence, and using this he was declared as being absent. 3. The remarkable rush to get to trial in less than 3 months with some 470 documents of 200 pages each. 4. The questions surrounding his post and his replacement in the Vice-Presidency, who has been put in charge of key issues in a referendum that could change the governance of the country. All these are issues that the Ecuadorians would like to see subjected to international oversight. There is an innocent man who has no assurances surrounding his safety and that of his family because of a process in which absolutely nothing was proven. It is important to recall that it was Jorge Glas himself who took the initiative before the National Assembly to be relieved of the immunity that his post would allow, in order to face the accusations and the harassment that he was being subjected to, trusting the judicial system of a country which he had served for so many years. 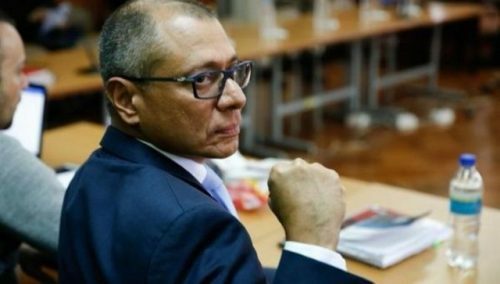 AA: Is there a political motivation behind the case of Jorge Glas? SG: You will have heard the term “Lawfare”, which unfortunately has become a trend in Latin America. It corresponds to using and abusing the law to achieve a political goal of removing influential people who might be opposed to certain projects. In other words, the politicisation of justice. It does not take an expert to see that in this case the script fits perfectly. The persecution dates back to when Jorge Glas was considered as a presidential candidate and later when he ran alongside Lenín Moreno. The media promoted on several occasions a number of allegations later proven to be baseless; media fanfare especially surrounding important electoral dates, activities that, through campaigns with a massive reach and frequency, were meant to smear a man who was key in the transformation and reconstruction of several sectors in the country during the last decade. Not only that, it also challenged the interests of traditional economic and political groups in Ecuador. The goal is clear, to make the “target” vulnerable in the public opinion for future accusations, even if they have no evidence. In this context the judicial abuses and aberrations become irrelevant in the perception of the people. In spite of said campaigns, the contribution of Jorge Glas as part of the electoral ticket was very important for the electoral triumph. AA: What was the result of the recent trial against your brother? SG: On December 13, with all the media present to make as much of a show out of it as possible, an oral ruling was produced sentencing him to six years in prison. However, this sentence is longer than the five years stipulated as the maximum under the current legal code. The judge made use of a penal code which is no longer in use. This, according to legal experts, is a blatant violation of “due process”. My brother found himself defenceless once more, like in many other occasions since his illegal arrest in October. Without a written ruling, there was no possible appeal for 40 days. Finally, the ruling was published in writing on January 23, more than 40 days since the end of the trial. On January 26 then an appeal was filed. AA: What does this ruling reveal in your opinion? SG: That the outcome was predetermined. The statement from José Santos de Odebrecht was transcribed to corroborate the previous allegation against Jorge Glas. In other words, the sentence was already there before the trial. Is the statement from a self-confessed criminal who is providing, in exchange for his freedom, a key piece to ruin the life of an innocent person, without any proof, any sort of evidence? The former Odebrecht attorney, Tacla Durán, denounced from Madrid that there were deals with Latin American governments in order for the Odebrecht people who had confessed to crimes to produce denunciations “à la carte” to serve certain political goals, all in exchange for rewards in terms of their own sentences. Up to now there has been no reaction from judicial systems. In the meantime, a political prisoner in Ecuador is being persecuted with new charges, his life and that his family are in danger. The ruling document, which is public and available to the media, shows a countless number of inconsistencies that anyone can spot, even without being a legal expert. For example, the ruling mentions a crime which is not the one that is being tried as the justification for a longer sentence than what the law stipulates. AA: On what offences is the ruling based on? In truth the only source and support to declare him guilty is the self-confessed criminal Odebrecht, who ended up being rewarded. The criminal assistances are based on archives coming from this company, in the case of the criminal assistance from the United States, and in the criminal assistance from Brazil it is based on José Santos’ denunciations. All of it is based on the allegations of the guilty company. In no case was any evidence presented. AA: What is the key point of Jorge Glas’ defence? SG: The absolute absence of evidence. An irregular trial is looking, at all costs, to mask the fact that an innocent man is to be made guilty. I will try to be more graphic: during the trial the prosecution presented around seventy supposed witness, the majority of them being technical experts, in charge of translating, transcribing, requisitioning and confirming the existence of places. In other words, the majority are not even experts. None mentioned Jorge Glas or referred his name as appearing somewhere. The other defendants, including three who confessed, denied having had contact with Jorge Glas or any participation from his part in their activities. If the main guilty party, José Santos, sees his charges dismissed and the other accused parties do not know the vice-president and even state that they are being used to implicate him, then what kind of criminal association are we talking about? Each piece of supposed evidence was picked apart during the trial. However, there is a media dimension which makes it irrelevant in the justice system. There is a blockade surrounding information in Jorge Glas’ case in the main media outlets in Ecuador. That is why it is urgent to make this known internationally. This article was posted on Wednesday, February 7th, 2018 at 1:53am and is filed under Courts and Judges, Ecuador, Interview, Justice, Legal/Constitutional.